Portland Marriott City Center is an ideal destination for business travelers who want to be right in the heart of the city. This impressive 20-story property is just a few minutes away from the trendy Pearl District and some of the best restaurants and cultural attractions Portland has to offer. 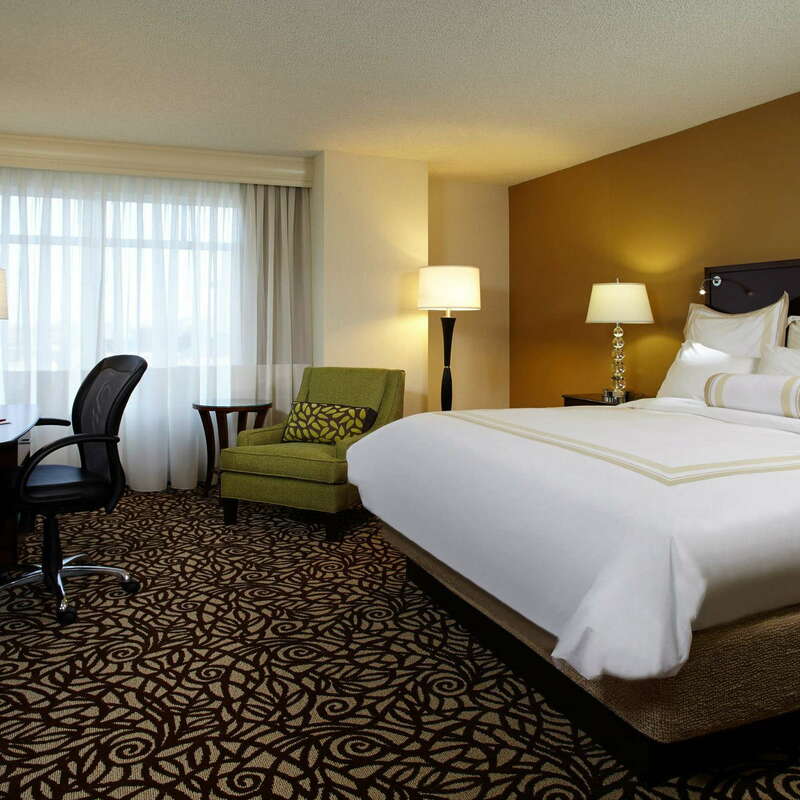 The rooms at Portland Marriott City Center are pretty standard for a Marriott property geared towards business travelers - comfortable (if a bit on the small side) and equipped with all the business necessities you need to get to work, like large workstations and coffeemakers. YOU SHOULD KNOW Wifi isn’t included in your room rate, so if you need to get work done during your trip, expect to shell out a daily fee to connect. The bathrooms at Portland Marriott City Center are well-designed (the marble countertops are a nice touch), but they’re definitely small. If you’re the kind of person who likes a lot of space in the bathroom, this isn’t going to be the right fit. The lobby of Portland Marriott City Center is warm and inviting, with comfy couches, a wall-sized bookshelf, and a dramatic staircase that winds up to the second floor, giving the space a distinctly old-fashioned-library vibe. If you’re visiting Portland during the winter months (when cold and rain is pretty much a given), stop by the lobby for a free hot chocolate to warm yourself up. The on-site gym at Portland Marriott City Center has everything you need to get a basic workout in during your stay, including cardio machines and free weights. 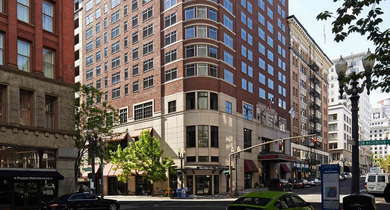 DEN (which stands for Drink Eat Network) is Portland Marriott City Center’s in-house restaurant. This spot dishes out upscale American fare that’s better-than-average with a focus on local ingredients (their Bourbon Burnside Wings are a guest favorite). DEN also boasts an impressive wine list (with most of the bottles lining the walls of the restaurant). Ask your server to recommend a local wine from the Willamette Valley to enjoy after a long day at the office. You can easily get around downtown Portland on foot, and if you need to get elsewhere in the city, there’s plenty of easy access to public transportation (the nearest MAX station is just a few blocks away at Pioneer Courthouse Square). If you do decide to bring a car, it’s $45 per night for valet parking. For some excellent food and the hands-down best views in the city, head to Portland City Grill (6-minute walk), an American restaurant on the 30th floor of the nearby US Bancorp tower where you can enjoy inventive seafood and steak dishes (many with an Asian flair) while you enjoy 360 degree views of the Portland skyline and Cascade Mountains. For brunch, try Mother’s Bistro & Bar (6-minute walk), a charming spot with shabby-chic decor that specializes in comfort food with a twist (don’t leave without trying their cornflake-crusted French Toast). For a fun dive bar experience, head to Kelly’s Olympian (3-minute walk). Founded in 1902, this is the only spot in Portland where you can find live music, great happy hour specials, and vintage Harleys hanging from the ceiling. 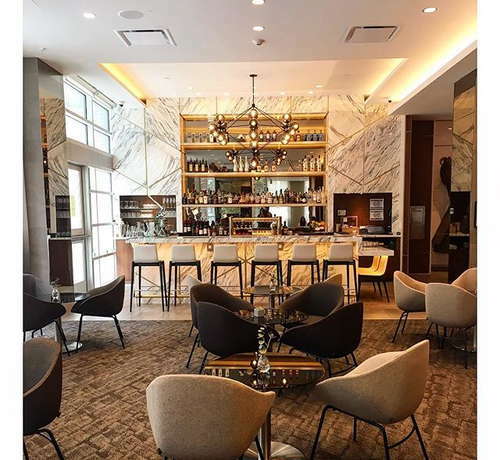 For a more upscale experience, try Shift Drinks (7-minute walk), a cocktail and wine lounge with interesting architectural details, like high ceilings, exposed piping, and vintage light fixtures. Portland Marriott City Center has everything you need to enjoy your next stay in Portland, from business amenities to easy access to public transportation, and it’s prime location is within walking distance of some of the best restaurants, bars, and attractions the city has to offer.